Another Great Idea Down the Drain? 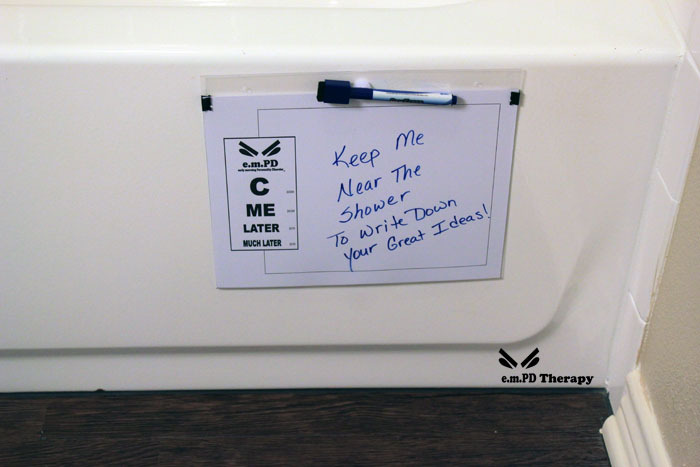 I need to come clean about something – I get some of my best ideas when I’m in the shower. There just seems to be something mystical about all of those tiny little water torpedoes finding their target as you close your eyes in surrender to the sounds of the rhythmic pulsations creating images of waterfalls in a botanical paradise. Kind of like this. When my Shower Muse shows up, great ideas just seem to flow, and they are beautiful. But, of course, I’m all wet and soapy, and by the time I get out of the shower and grab a pen, all of those great ideas are history, swirling down the drain like so many tiny bubbles. There was a time when I could remember every thought that crossed my mind. Mostly. But those days are a vague, distant memory, gone the way of the covered wagon and the Pony Express. These days, things pop into my head and disappear almost as quickly as they arrive, like fireflies and faerie dust. I actually discovered a solution to this problem years ago, during one of my musing moments in the shower, and I have shared it whenever this conversation comes up. Now, I would like to share it with you. 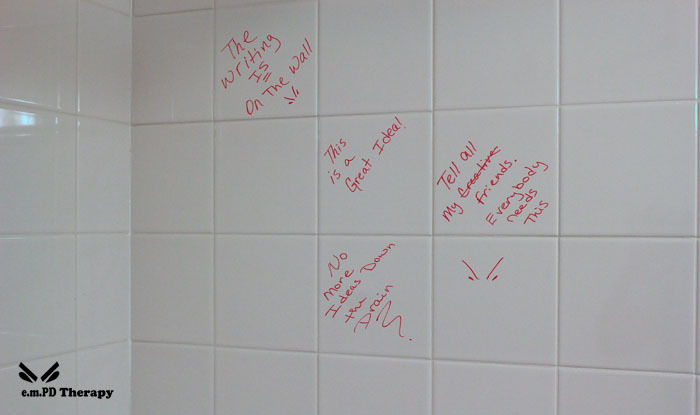 A word of caution is in order – I have found that not all markers are created equally, and neither are the shower walls. I would suggest that you find an inconspicuous spot to test before you commit. If your markers leave a stain or end up being hard to remove, you can try window cleaner or a cleaner made for dry-erase boards. I know that some of you are thinking, “I don’t have a plain old white shower, I have beautiful slate tiles” – or something along those lines. All is not lost. Check your local office supply store for a moisture resistant dry-erase board, or, you could easily make one using a precut sheet of acrylic, or an acrylic photo frame. I added a background to this one just because, and to make it easier to read. I also happen to have a metal tub, so the magnets on the back keep it handy. If you don’t happen to have a cool metal tub like this one, you could use a couple of those suction cups with the hooks on them to attach your board to the shower wall.